January 25, 2015. 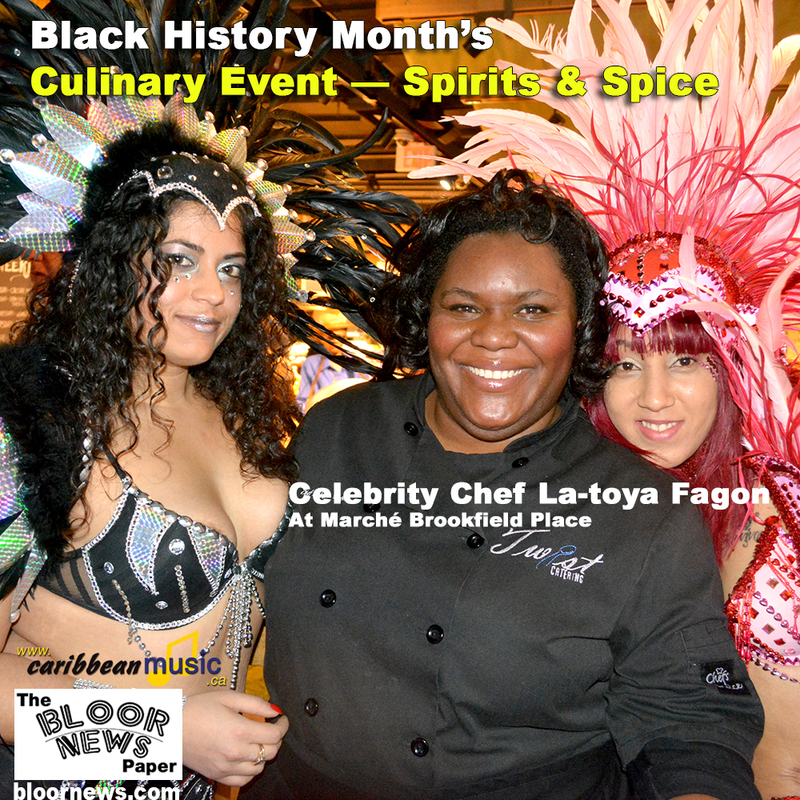 Toronto ON – Black History Month’s Culinary Event — Spirits & Spice — takes place February 2 – February 8 at the Marché Toronto, Brookfield Place in downtown Toronto. This is a fund raising food festival for the Caribbean Scholarship Foundation and features the exotic cuisine of Caribbean Canadian chef La-toya Fagon. This Black History Month festival is exclusive to Marché Toronto. The restaurant and the Caribbean Canadian community invites the city to enjoy the warm aromas, pulsating rhythms and spicy tastes and drinks of the islands. During Spirits & Spice, Marché will feature a selection of Caribbean dishes featuring Grace Kennedy (GK) products created by Chef La-toya Fagon alongside its usual menu items. The food is cooked right before patrons’ eyes with seasonal products from the Caribbean. The GK Grilling station featuring Grace Jerk, Rubs and Sauces is a must try for all steak and meat lovers. As well guests will find Caribbean inspired beverages and smoothies at the juice station, while, the in-restaurant bar will feature English Harbour Rum (Antigua), Carib Beer (Trinidad and Tobago) and the unique Relax Riesling and Funf 5 Riesling wine that will be paired with the island dishes. Caribbean desserts and even coffee with a Caribbean twist will be available for guest to enjoy. Spirits & Spice week kicks off on Monday, February 2nd and ends on Sunday, February 8th. The Caribbean Scholarship Foundation (CSF) Spirits and Spice event is an annual fundraiser for the Foundation, which in December 2014 gave out $10,000 in scholarships to deserving students from the Caribbean Diaspora in Canada. Kyler Philip, Jasmine Francis, Justice Betty and Nathalee Ewers were each awarded $2,500 as part of the “Feature Leaders” Scholarship. The Future Leaders initiative is a partnership between CSF and Western Union and includes an innovative mentorship program designed to give students an added advantage in their academic pursuit. CSF is also supporting PACT as part of our 2015 community initiative. The Toronto Area based charity is dedicated to working with, supporting and empowering at-risk youth, as well as youth already in conflict with the law. Recently they have embarked on the empowerment of women in diversity communities. David Lockett is a hands-on volunteer, Co-Founder and President of the PACT Urban Peace Program, and a proud supporter of Chef Fagon a young Black woman who is making her mark as world class Chef. Chef Fagon has been supporting PACT for the last 9 years by donating her time to teaching culinary courses. Recently with the launch of the Jean Augustine Empowerment Center, PACT cooking courses has grown with Chef Fagon teaching young women different forms of empowerment, budgeting, and nutrition. Western Union will present our Exclusive Media day which will be held on February 4 at Marche from 11:00am – 1:30pm exclusively for members of the media. Chef Fagon will do live cooking demos and attendees can taste a variety of delicacies from around the Caribbean, while sampling the region’s finest spirits beer and also some great wines. Members from CSF and PACT will be on hand to provide information about the programs and scholarship opportunities they provide. There will be plenty of excitement on Media day and all week long with live music and giveaways. Over 30,000 patrons are expected to take part in the week long festivities, many of which will be delighted for a taste of the tropics in the heart of winter.